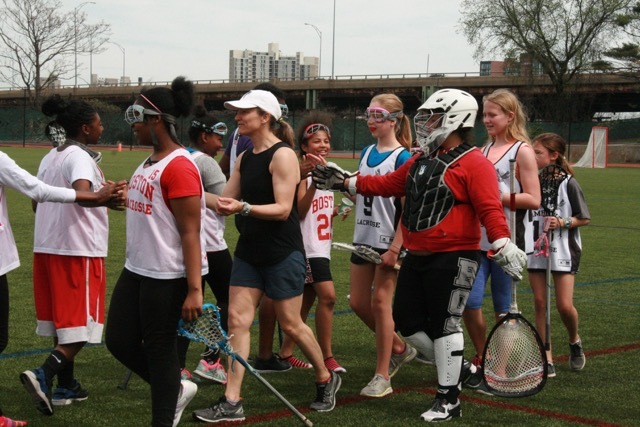 On Saturday, April 29th, Boston University invited TechBoston student-athletes back to campus for another extraordinary day. The Terriers pulled out all the stops for the Bears, beginning with a welcome sign on the Jumbotron as the bus arrived. The Terriers then let HLers use Nickerson Field for a teaching scrimmage against Cambridge Youth Lacrosse. It was the first game-like experience for the Bears and valuable lessons were learned throughout. Cambridge and TBA mixed teams, facilitating new friendships and a competitive game atmosphere. After the scrimmage, Cambridge and TBA sat down on the bleachers for a shared pizza lunch, while they waited for BU to come out onto the field for warmups before their game against American University. When the Terriers came out, Head Coach Liz Robertshaw invited HLers to watch warmups from the players bench. Liz then came over and gave the group a pep talk about lacrosse. As the Terriers continued to warm up, Cambridge and TBA players were led into the BU locker room to catch a glimpse of the life of a collegiate athlete. The locker room was decorated for Senior Day and the girls had fun exploring the space. After the locker room tour, the group formed a spirit tunnel for the Terriers to run through as they came out for their second warm up. As HLers watched the second warm up and waited for the game to begin, they wrote letters to Terrier players and made signs to hold during the game. The game started and BU took control early, never relinquishing their lead. Cambridge and TechBoston cheered and chanted together the rest of the afternoon. The groups were announced at halftime and there was even a t-shirt toss. After the game, the girls lined up for autographs and photos with their Terrier buddies to end a special day. 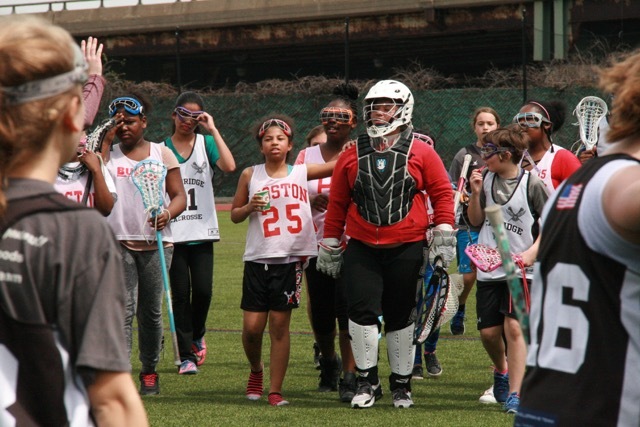 We want to send a huge thank you to Coach Liz Robertshaw and her team for welcoming us to campus, allowing us to use their field and view their locker room, and providing an awesome experience for our student-athletes; to BU Assistant Director of Marketing and Promotions Nafeesa Connolly for setting up our schedule and unique access for the day; and to Cambridge Youth Lacrosse Coach Lisa Kaneb for sharing the day with us and for reffing the teaching scrimmage. We are so grateful for such amazing partners and can't wait for when we meet again!